Standing by the iconic John o’Groats sign in the far north of Scotland, 550 miles from home, with the wind blowing over what used to be my hair, was one of those bucket list moments in my biking life. But the journey here had begun a long time ago. To be precise, it started five years ago when my mate Carl and I grabbed our bikes and headed vaguely in the direction of the Scottish Highlands from our homes in the East Midlands. We didn’t book any accommodation in advance, partly because it was September and we figured it wouldn’t be too busy, and partly because it was indeed September and the weather was likely to dictate which way we wanted to go. Carl was on his 2005 BMW R1150GS Adventure, and I was on my identically aged Yamaha FZR 1000 Fazer. 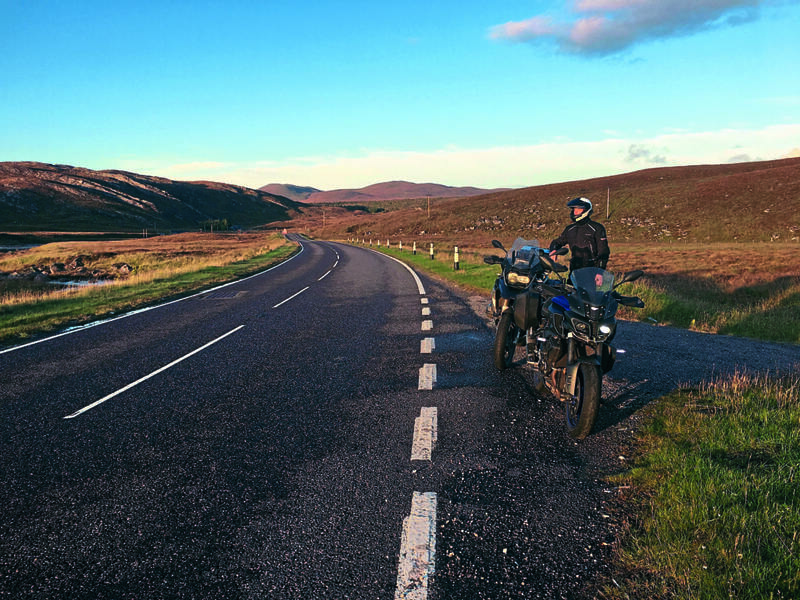 It was my first riding trip to Scotland, and as it turned out, the first of many. We still ride the same bikes, and put a reasonable amount of miles on them every year, but they are 12 years old now and we were curious about what has changed in that time. So, in October 2017 we decided to do the trip again, only with the modern equivalents of our bikes – or at least the closest we could find. Carl’s bike for the reunion trip was the BMW R1200GS TE Exclusive, so not an Adventure model, but it had all the possible gadgets available in the GS range so we figured it would be the one to go for. 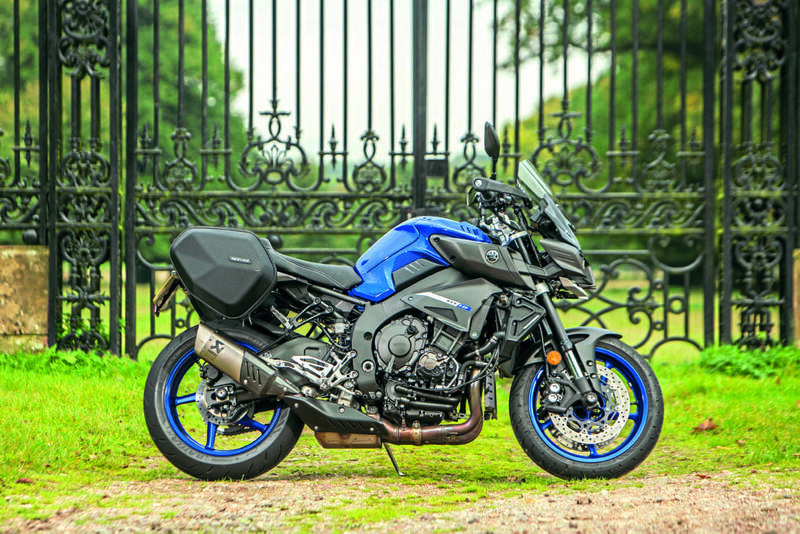 I was on a Yamaha MT-10 Tourer Edition ¬– again, not exactly the direct offspring of the Fazer, but it’s the current ‘sensible’ Yamaha derived from the R1, just as the Fazer 1000 was back in the day. 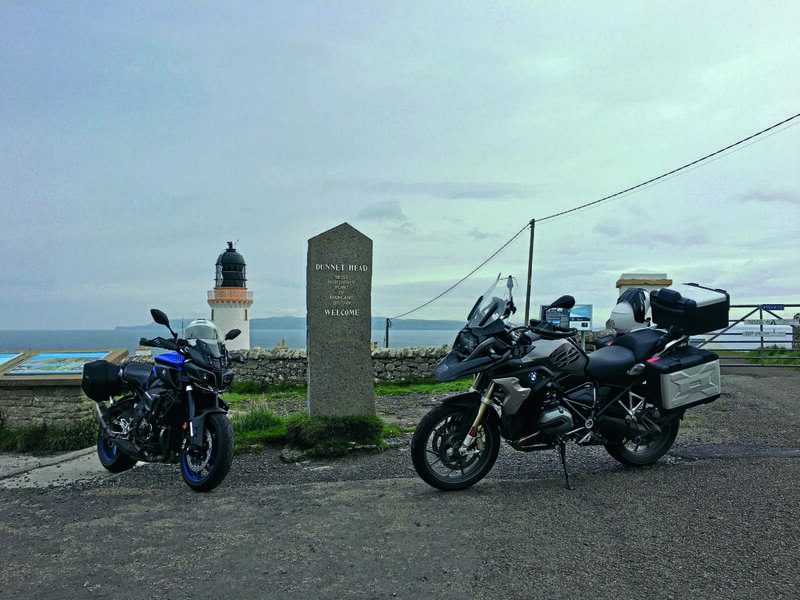 The idea was to see how much the bikes had developed in 12 years, whether the roads and places we visited in Scotland were still as good as they were five years ago, and if we’d have as good a time as we did on the first trip. We always knew that the new models would be light years ahead of our old bikes, but it was still a bit of a revelation to jump straight from the old bikes to the new: we only got a few hundred yards down the road before we stopped at traffic lights and Carl pulled up next to me: “I can’t believe how light this bike is. It feels completely different from my old one: it’s lighter, smaller, smoother and more powerful,” were his first impressions. As it happens, I had just been thinking the same about the MT-10. It seemed to be a lot more manoeuvrable than I had expected, and certainly a lot more powerful than the old Fazer, which I never found lacking in power in the first place. 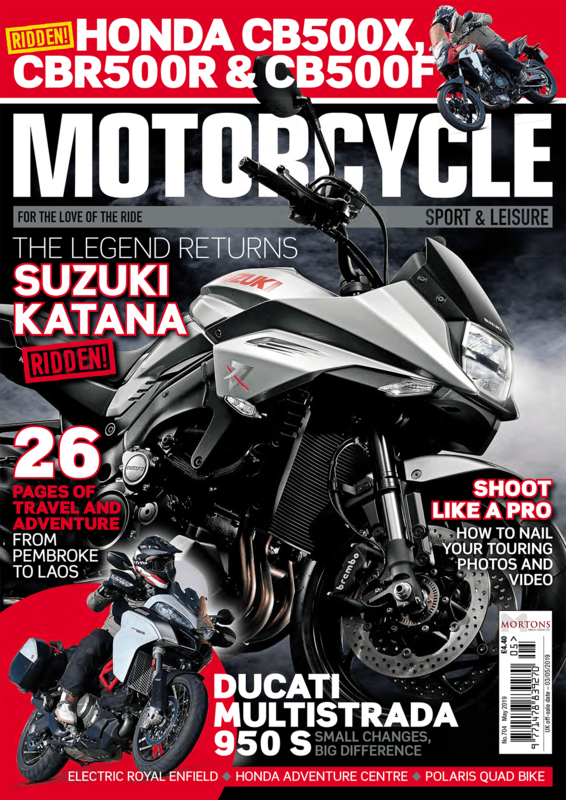 On a couple of occasions when I went for a rapid overtake the difference between the two bikes was clear as the front wheel skipped along the tarmac toying with the idea of taking off, but just about maintaining contact with the ground. The electronics keeping the MT-10’s rear wheel biting the tarmac and the whole package horizontal are incredibly clever. And among all the updates that the bikes have gained in over a decade, it is indeed the electronics that are arguably the biggest leap forward in terms of technology on both bikes. 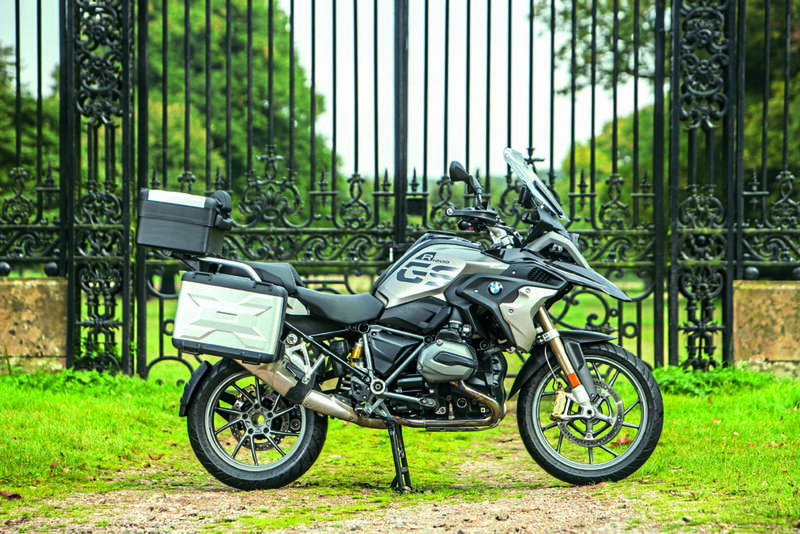 To Carl the GS seemed very different from the old version, with not just ABS like his old GS had, but also traction control, electronic suspension, ride modes and even keyless ignition. Switching the suspension from Road to Dynamic firms it up, and allows you to ride the bike a bit more aggressively than its adventure touring looks might suggest. “It just makes me realise that my GS’s suspension is pretty knackered ¬– it’s like riding a pogo stick compared to this,” was Carl’s verdict. 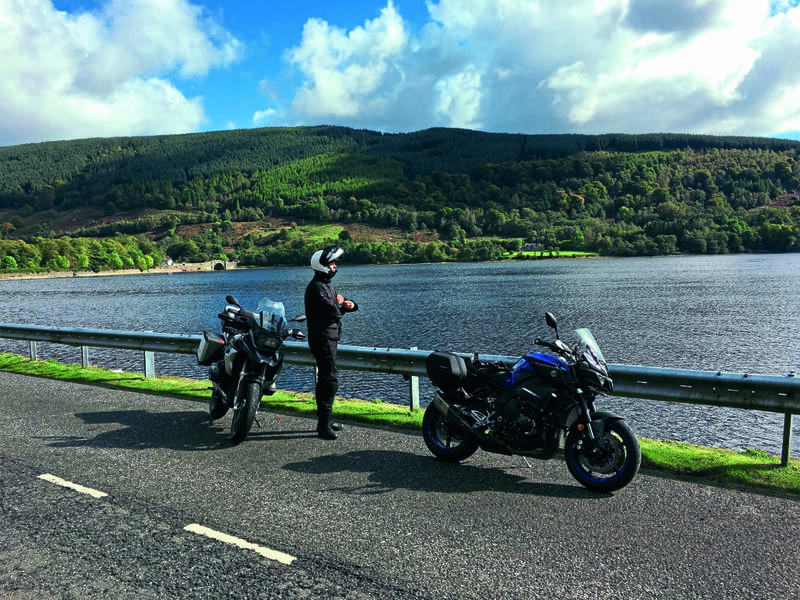 The riding modes on offer are Rain, Road, Dynamic and Enduro, but they didn’t seem to make as much of a difference in handling as the suspension settings, and Carl settled into switching between Road and Rain, depending on how Scottish the weather was. The Yamaha is equally advanced compared to its predecessor. 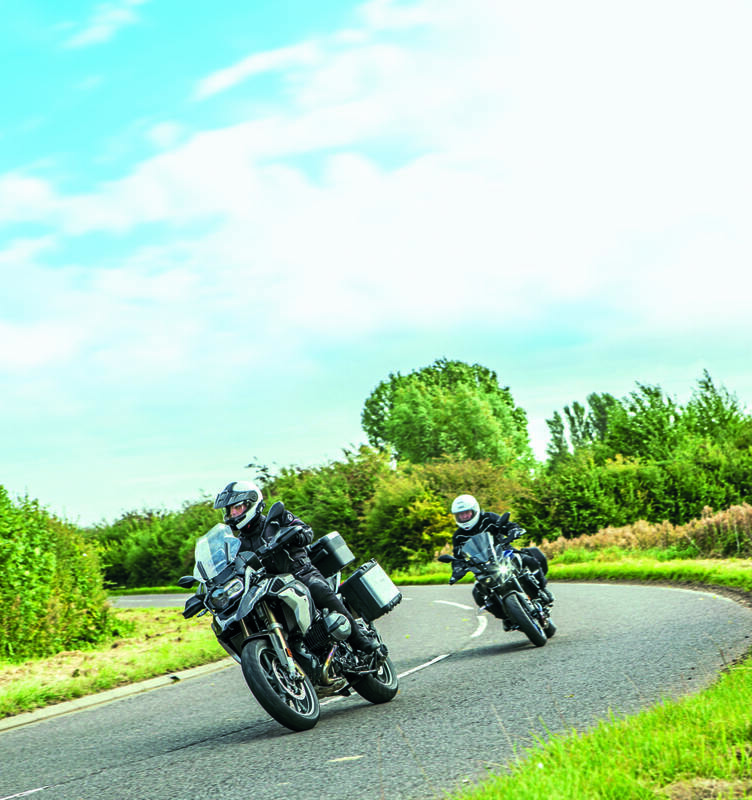 While the Fazer lacked any rider aids, such as ABS and traction control, the MT-10 boasts both of those, as well as ride modes, but relies on traditional, fully adjustable suspension. The ride quality was great from the start with the suspension slightly on the hard side, but the 120mm travel both front and rear offering enough comfort for serious mile-munching. Over the first couple of hours on the road I went through the Yamaha’s ride modes (STD, A and B) but didn’t find much difference in them and settled for STD, which seemed perfect for touring while still offering plenty of poke should I need it. The first day of riding was supposed to be the boring bit, making progress on bigger roads to get within spitting distance of the Highlands. But we didn’t even get over the border before we had helped a horse and rider cross the road and nearly been wiped out by three different cars pulling out in front of us – I guess there are no boring rides. Both bikes feature cruise control, which was much appreciated on our long and rainy ride up the A1 to Scotch Corner, across the A66 to Penrith, followed by the A75 and A76 to Ayr, where we stayed the night. On the motorways both bikes behaved in an exemplary fashion, with the cruise control making life easy and the screens helping to keep the rain at bay. Carl took a little while to find the best possible position for the adjustable screen on the GS, while I was instantly satisfied with the fixed screen on the Yamaha. It took the wind off my body, leaving only my head and the top of my shoulders in the airflow. I’m not usually a big fan of screens, but this one worked a treat. I just wish the mirror arms on the Yamaha were an inch longer to help me see more of what’s behind me and less of my jacket sleeves. If the first day had been rainy and mainly spent on motorways, the second day of our trip was the complete opposite: we rode all day in glorious sunshine, on some of the finest roads I’ve ever been on. 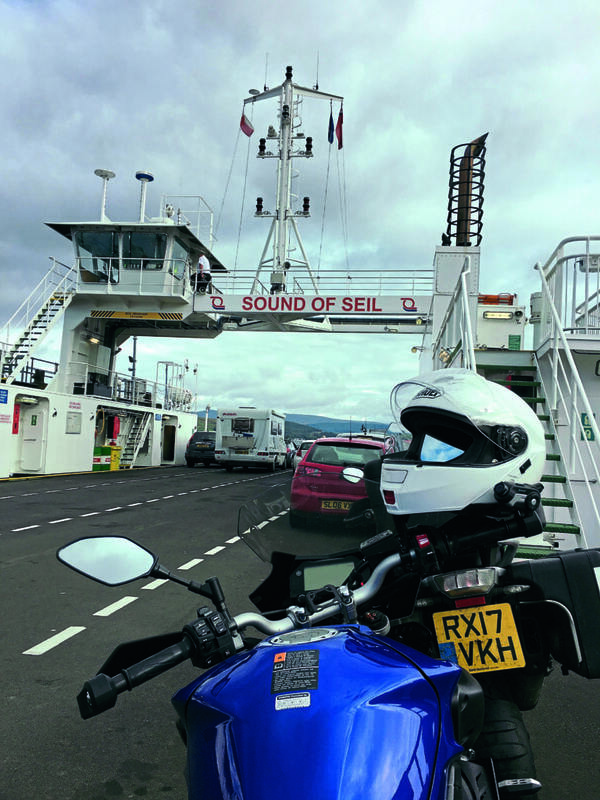 From Ayr we followed the coast up to Greenock and took a ferry to Dunoon – and that’s where the really good riding started. We continued up to Inverary, then Oban and Fort William, further up to Fort Augustus and then towards our second night’s stop, Ullapool. Throughout the day the roads got gradually better with less and less traffic, and increasingly dramatic scenery. The final stretch to Ullapool on the A835 was the icing on the cake, even if we struggled to see where we were going with the setting sun in our eyes. On day two the bikes continued to impress. With dry roads we managed to get a bit more out of the ample power on offer, but still not getting close to using everything that was on offer. With 125bhp the new GS has almost 50% more power than the 1150, and Carl was finding overtakes a lot easier than on his old bike. The MT-10’s peak power is 160bhp as opposed to the Fazer’s 140bhp, and on a bike that only weighs 210kg you can really feel the power. It doesn’t seem to matter where you are on the rev range, what gear you use or how fast you’re going – there’s always power when you ask for it. As the roads got more interesting both bikes had a chance to impress with their cornering ability. They both tip into corners with great ease and hold a line without a struggle. 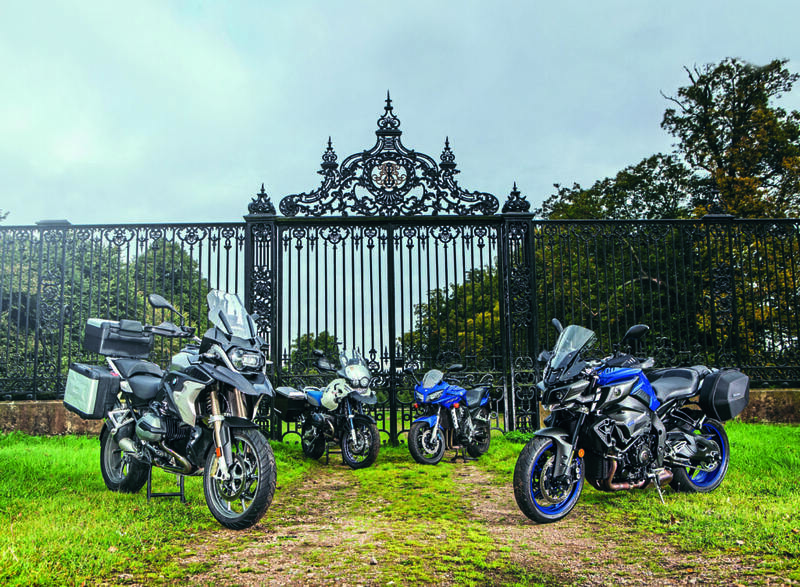 The GS in particular, with its 190/200mm suspension travel and ESA automatic suspension, seems to also soak up any bumps in the road to the extent that it’s difficult to tell if there are any. 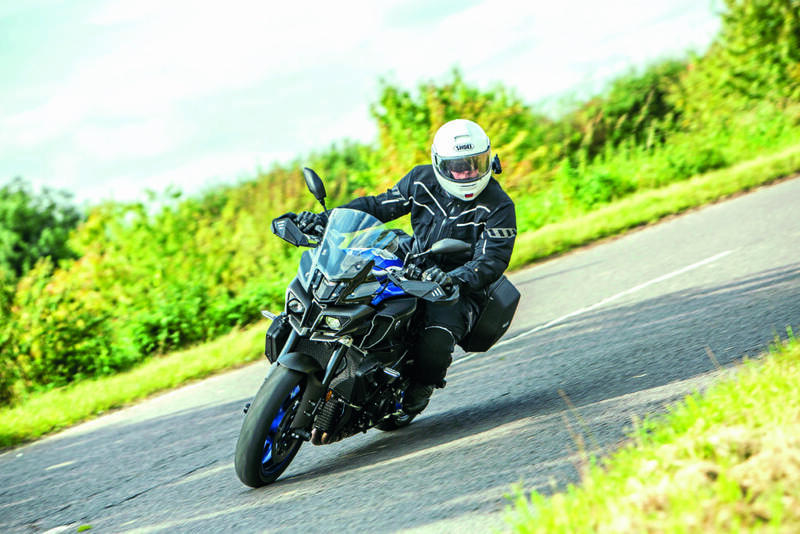 The MT-10 hasn’t got the same level of suspension travel or the benefit of automatic suspension (although it is fully adjustable), but while the suspension works well it feels decidedly more firm than the GS. Day three consisted of riding a part of the North Coast 500 (or NC500 for short) route from Ullapool to John O’Groats. I had thought that the roads around Fort William and on to Ullapool had offered some great riding and dramatic scenery, but the A835 heading north out of Ullapool and then the A837 from Ledmore blew everything I’d seen before right out of the water. The mountains on the west side seemed to touch the sky, while the sea on the left was eerily calm. Soon after we passed the ruins of Ardvreck Castle, the road turns into the A894, and then we followed the A838 from Laxford Bridge all the way to Tongue. From there we took the A836 to John O’Groats. In all honesty though, you don’t really need to worry about the road numbers as long as you have the coast to your left and good roads to ride on. After about 55 miles of the biking Nirvana of winding A roads from Ullapool, the road turned into a single track for a long stretch, and there were quite a few camper vans to overtake, but most of the drivers seemed to be only too happy to pull in and let us past. With a lot of slowing down and speeding up, the gearboxes got a good workout on day three, and the quickshifters on both bikes proved useful. Carl found that on the GS the shifts from first to second and second to third were a little jerky, but higher gears seemed to slot into place easier. The same applied going down the box using the auto-blipper. On the Yamaha, I found that in towns I tended to use the clutch to shift up just to keep everything smooth, but accelerating out of town the autoshifter worked a treat, with much more effective gear changing than I could ever do myself. Even though the road along the north coast is a single track for a fair distance it’s still reasonably fast on a bike. What slows you down is the constant temptation to stop for photos – the scenery is genuinely breathtaking, and surprisingly varied, from rocky mountains that look like they belong to a Tolkien story to more gentle green hills and fields further west. 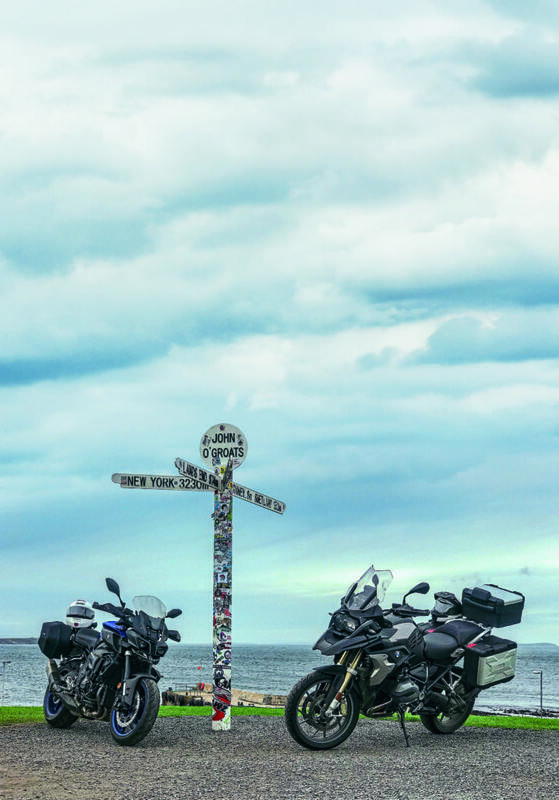 The day ended at the iconic signpost at John O’Groats – another box ticked on my biking bucket list. Day four started with glorious sunshine and a gentle coastal ride down south. Again, the scenery had completely changed with gently rolling hills and a big wide road hugging the coastline. From Inverness we carried on to the Cairngorms on the A9. The area is fertile for distillery touring, with plenty of Speyside whiskies made here. We stopped at the Dalwhinnie Distillery, and since we couldn’t taste anything while we were on our bikes, we picked up some little bottles to take home – it would have been rude not to. 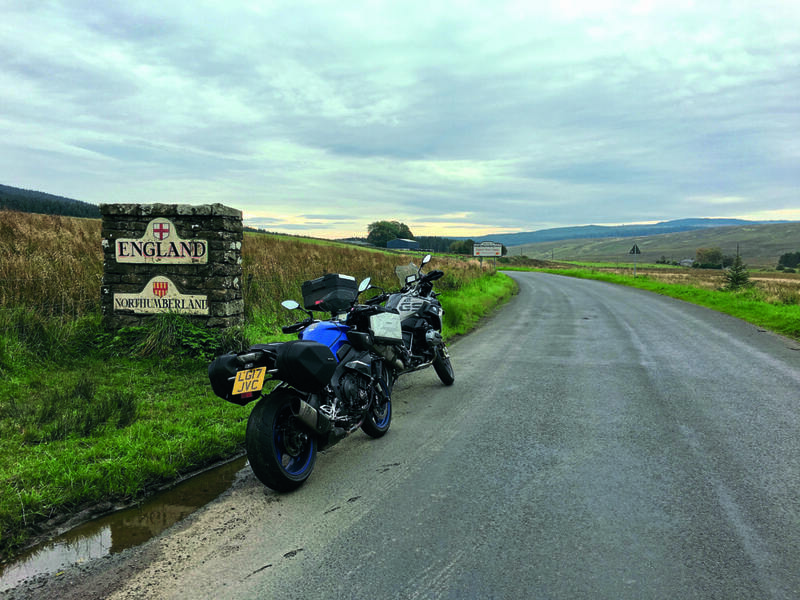 We spent the night in Falkirk and on the last day of riding took in the A7 down from Edinburgh as an alternative to the A68 that we’d both been on numerous times. It turned out to be a good choice with some lovely twisty sections leading us in the general direction of Kielder Forest Park. The last leg of the trip was on the A68 and finally the A1. It wasn’t until we were within an hour’s ride from home that I first started to feel like I was ready to get off the bike. Being on the A1 didn’t help as you don’t tend to move on the bike much on a big road like that, and the thought of nearly being home must have played a part too. Carl on the other hand was still as comfy as ever on the GS. If truth be told, I was a little envious of the level of luxury the BMW offered. The new bikes were always going to feel great compared to our old models, but exactly how they impressed came as a bit of a surprise. I had anticipated being blown away by the sheer power and light chassis of the MT-10 Tourer Edition, but I was most impressed with it being so much more comfortable than I had expected. The screen (although unadjustable) takes the wind and rain off your body, leaving your head in the clean air, and best of all creates no buffeting at all. The comfort seat isn’t hugely different in terms of comfort from the standard seat, but looks good and is easily comfy enough to ride the tank empty without stopping. 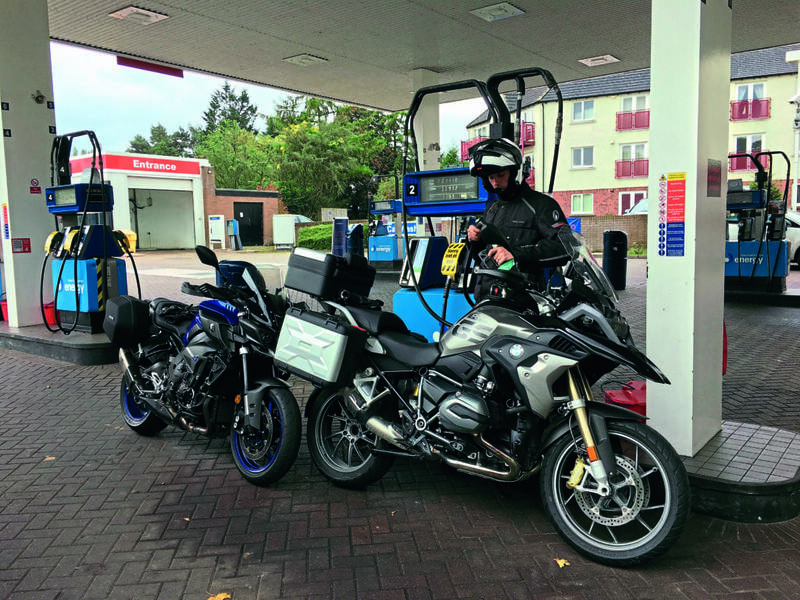 Which brings me to the only real negative of the MT-10: with a 17-litre tank and average 40mpg that I achieved on our trip, I was on the lookout for the next petrol station after every 100 miles. But fuel economy aside, it’s very difficult not to love the MT-10. It’s surprisingly comfortable, hugely powerful and extremely fun to ride. I managed to fit all my luggage in the 20-litre each panniers without even bothering with a tail or tank bag, and the bike didn’t seem to handle any differently with the luggage on. The GS on the other hand is built exactly for this sort of thing: big miles, big loads, big smiles! It doesn’t offer the same sort of performance as the Yamaha, but in terms of rider comfort, you can’t fault it. With the bolt-upright riding position, wide bars and heated grips, and the adjustable seat and screen, it’s popular for a reason. As for Scotland, it’s still in my eyes the best place for riding in the UK. The north coast is far away from pretty much anywhere else, but it’s worth taking the time and making the journey. The roads, scenery and people you find there will make it an unforgettable trip, regardless of what bike you ride. I wonder what the bikes will look like in another 12 years… Maybe the next reunion trip will be made on electric GS and MT-10?